Representatives from Rare, Divina Hojas-Lade and Japy Silapan led a discussion on the importance of social marketing and education and outreach as a component of conservation activities. 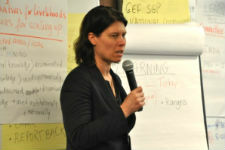 Ms. Hojas-Lade remarked that “conservation is about people as much as it is about species or ecosystems. People are both the cause and the solution to environmental problems”. Rare focuses on behavior change as a means for providing social goods. They do this through the use of social marketing to change attitudes, share knowledge and inspire conversation. These tactics, in turn, affect changes in behavior. This type of technique can be used promote a product, provide a social good like reducing smoking, or most importantly for the community members, encourage natural resource management. Rare does this by combining knowledge, attitudes, interpersonal communication and barrier removal to affect behavior change, threat reductions and ultimately a conservation result. 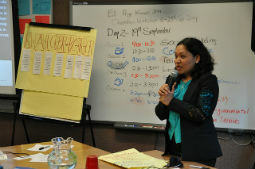 Participants in the community dialogue were presented with a series of actions that they had to identify as a form of knowledge, an attitude, etc. in order to help conceptualize how the process functions. Rare continued to give examples about how this technique has led to changes in behavior and ultimately conservation results in their “bright spots”, which are areas where their technique has been particularly successful. Rare closed by discussing its fellows program, which provides training for employees of local organizations in order to run a social marketing campaign to improve conservation efforts in the area. After a short break, participants were broken up into four thematic groups: (1) Sustainable Forest Management, (2) Protected Areas: Indigenous and Community Conserved Areas, (3) Sustainable Land Management of Dry Lands, and (4) Marine Resource Management. 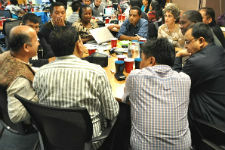 Participants discussed shared challenges and highlighted unique struggles in their particular regions. Each organization practiced the efficient delivery of their elevator pitch which were later summarized and presented by group leaders. 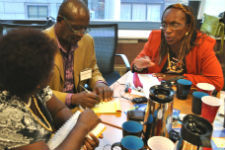 Participants were encouraged to share successful strategies already employed and to collectively identify unaddressed needs. The groups concentrated on challenges particular to their thematic work including disaster-risk reduction strategies, food security, displaced peoples, crisis prevention, agriculture, livestock management, human resource management and resilient responses to natural disasters and climate change. 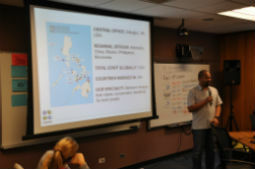 The host of the workshop was Delfin Ganapin, Global Manager of the Global Environmental Facility Small Grants Program (SGP). 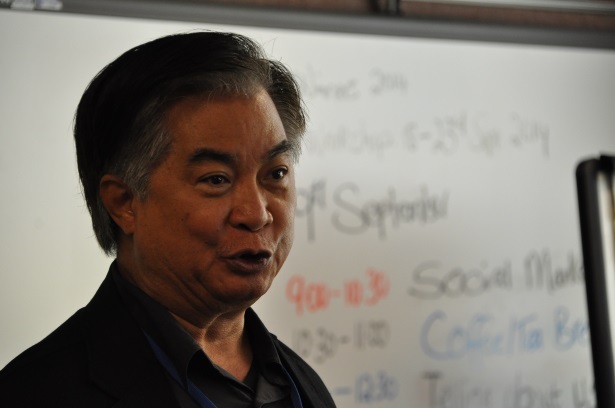 Mr. Ganapin provided an overview of the Small Grants Program and invited award winners to take advantage of the funding opportunity to scale their impact when returning home. Mr. Ganapin explained that the goal of SGP is supporting local organizations in need of capacity building with priority given to vulnerable communities. Priority sectors currently include women’s empowerment, and indigenous communities, as well as youth and disabled populations. Mr. Ganapin explained that (1) projects must be prepared and implemented by a community or civil service organization, (2) the work must be linked to environmental conservation, poverty reduction and local empowerment, and (3) in-kind co-financing is a requirement. Approval of proposals takes place at the country level through the national steering committee. New initiatives of SGP include “Knowledge and Best Practice Fairs” where winners share best practices on a national level. A participatory video method is being developed to create a more accessible proposal process in which “difficult to reach” groups are welcome to apply. 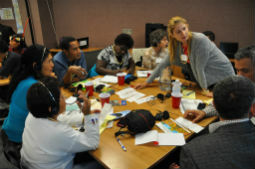 Case studies of future grantees will be loaded to a digital library of community innovations to share lessons learned. EI awardees were then welcomed to the SGP family and invited to ask questions. Mr. Jonas Syapze, of Organisation pour l'Environnement et le Développement Durable in Cameroon, asked if funding cycles are ever extended. Mr. Ganapin invited previous winners to apply for additional funding if they have entered a new operational phase in their growth. He admitted that it takes an average of 15 years for a CBO to become self-sufficient so longer granting periods are of necessity, but he also reminded the group that grants are intended to build capacity and not create dependence. SGP is currently committed to national coordinators serving as Grant Makers+, which calls on them to assist grantees to secure additional funding partners after an initial award from SGP, as well as continuing to monitor current grantees’ work and progress. Mr. Bruno Paladines, Asociación Comunitaria Bolívar Tello Cano in Ecuador, asked if receiving an SGP grant helps an organization to receive needed government support. Mr. Ganapin explained that the UN can serve a unique role in closing the gap between community leaders and national governments and encouraged leaders to speak with the GEF national office to request such assistance. As Esther Mwaura, lead facilitator, gathered groups back together, they were asked to present elevator pitches that would succinctly capture the essence of their work. After the Sustainable Land Management/Drylands group presented their work, they were asked to comment on themes they wished to pursue further. 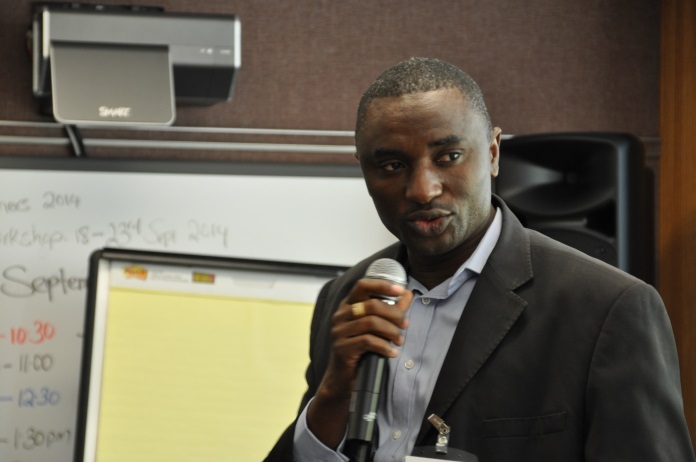 Kevin Muneene Kamuya of Utooni Development Organization in Kenya mentioned how impressed he was with Tajikistan-based Water is Hope’s water distribution system, which has decreased the potential for conflict. He hopes to gain insight from the organization about how to navigate natural resource management amongst different groups within a country. 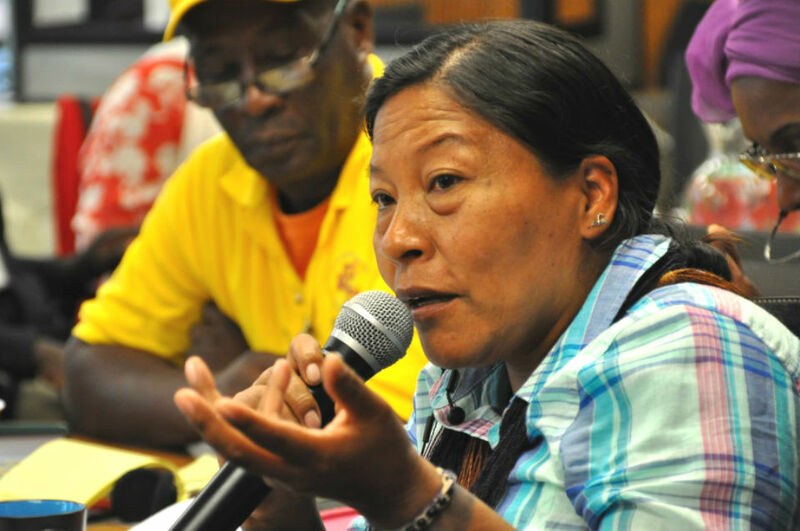 Ivy Veronica Gordon of Jeffrey Town Farmers Association in Jamaica spoke on behalf of her organization and Tulele Peisa of Papua New Guinea to detail their shared challenges that included increased soil erosion and securing access to safe drinking water. The group was asked to explain how land ownership in their nations affected their work. Ms. Gordon explained that land ownership in Jamaica is passed down generationally often untaxed and without titles which has led to a large percentage of land remaining unproductive. Tom Lalampaa of the Northern Rangelands Trust in Kenya provided an overview of organizations committed to protected areas. 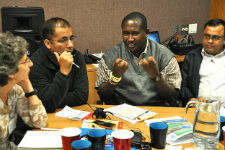 Following their presentation, the group was asked to comment on the role of government in their successes. 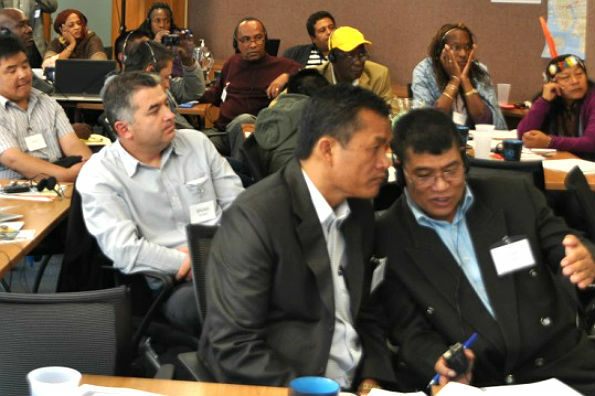 Both organizations from Nepal, Alliance for Integrated Development and Conservation Area Management Committee, noted that there has been greater harmony between NGOs and their national government since post-conflict reconstruction, and they have received financial support gathered through taxation of the tourism industry. 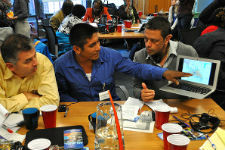 Within the Indigenous and Community Conserved Lands group, organizations from Latin America discussed their shared struggles working with their national governments. Leydy Martín of Koolel Kab/Muuch Kambal explained her organization’s need to take their fight for land rights to the local court in Mexico. The synergy of conservation and female empowerment was highlighted by Manuela Omari Ima Omene as she described the work of Asociación de Mujeres Waorani de la Amazonia Ecuatoriana. Within the Marine Protected Areas group, Jonas Kemajou Syapze of Organisation pour l'Environnement et le Développement Durable in Cameroon explained how his work to conserve mangroves species has also improved women’s health as cooking techniques have become less dependent on traditional fish smoking. Zafer Ali Kızılkaya of the Mediterranean Conservation Society in Turkey highlighted that his organization’s work to increase local awareness of no fishing zones became most effective when engaging directly with fisherwomen. The day’s sessions were concluded by guest speaker Susan Alzner of the United Nations Nongovernmental Liaison Service (NGLS). Ms. Alzner shared her personal story of working with indigenous people in the 1990s to defeat the development aggression of energy companies and, thus, offered her gratitude to the award winners for their committed work. Ms. Alzner’s career began as a photographer documenting the work of the energy industry. Drawn to advocate further, she began organizing cross-country bike rides that invited riders to enter the reality of indigenous peoples and witness first-hand the effects of the energy industry on their communities. Today, Ms. Alzner is working to achieve policy shifts through continued advocacy and promotion of the MDGs. Ms. Alzner explained that the United Nations is currently at work to develop a post-2015 framework for sustainable development. She shared that the new framework will likely propose 17 new development goals to be launched at the end of 2015 and a detailed system of monitoring and evaluation. Ms. Alzner applauded efforts to respect indigenous people’s rights within the new framework and include their knowledge as best practices. She also celebrated the Equator Initiative as a successful bridge between the Climate Summit and the Indigenous World Conference. 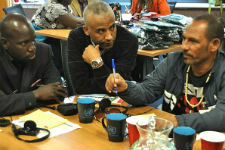 The role of NGLS was described as a liaison service to channel people’s voices to affect the work of the UN. As an example, Ms. Alzner explained that her office disseminated Google Forms in seven languages worldwide to receive speaker nominations for the Climate Summit. 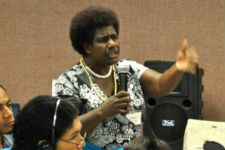 She was pleased to announce that as a result of this grassroots effort, several indigenous speakers were invited including 2014 Equator Prize winner Ursula Rakova of Tulele Peisa in Papua New Guinea. Ms. Alzner invited all winners to frequently visit the NGLS website to discover ways in which local leaders can participate in UN dialogues to affect decision-making.